My mother’s right gloved hand comes up; she waves as the train jolts, catches its momentum and moves with slowness that gradually turns to speed. I did not wave back, ‘I hate you, I hate you with every bone in my body, you do not want me,’ I cry out aloud, as warm, salty tears slip down my cheeks. I catch hold of the iron rail on the carriage door, as the train groans into action, and the rhythmic sounds of rickety rack, rickety rack grow quicker and quicker, my mother’s face changes to flashes of greenery, trees, bushes, tunnels fly past. My tears come back, unstoppable. I wipe my face with the sleeve of my woollen coat, a new coat, because living in Malaya thick woollen coats or clothes are not required. My red shorts, purple tee-shirt, and my flip flops were all I wore in a hot climate. This coat is alien to me, so are my black leather shoes that feel heavy and clumsy on my feet. I feel my eyes well up. Then blackness, as the train rushes into another tunnel. My eyes dazzle as brightness appears, the sun forcing me to squint. I hear a loud bang behind me. I am curious, ‘what is that noise?’ I ask myself, but afraid my fellow passengers will see me crying, I stay perfectly still with my nose hard up against the cold glass window. Perhaps it is only minutes, but it feels like a lifetime, then my childlike curiosity overtakes me, and for the first time on entering the carriage I move my head slowly to the left. I am alone in the carriage, just me and a wicker basket on the seat opposite. I turn back to the window, my mother’s face comes into view, just for a fleeting second, then gone. I feel so utterly wretched, and so very alone. My eyes well up once more, but before a tear escapes, I hear a low rumbling noise, from within the basket. The small opening is held fast with straps. Something looks back; I can see two shiny objects close together, glistening in the darkness. The rumbling sounds get louder, the basket rocks very slightly. 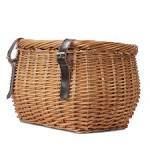 I feel drawn to this wicker basket, I move closer. My tears held firm in their tear duct. This basket has my full attention; my mother’s face is nowhere to be seen. I peer into the basket, something peers back, our eyes lock. On closer inspection my ears pick up a loud purring sound. I put my hand slowly through the gap in the straps, and feel soft fur, my touch increases the sound of purring. Something warm and furry rubs against my fingers, something wet tickles my palm, something rough licks my hand. I sit next to the basket, my hand still touching the soft fur. I feel a warm glow transcending through my body, all tears that have previously rushed through as though a dam has bust, quickly stop. The dam has been blocked by the furry, purring creature in the basket. The train comes to a halt. I instinctively grab the basket. I unknowingly hold onto the straps. They come away in my hand. I sit back on the seat, and gaze out of the window. The next stop is mine. I will be leaving this train, and on a new journey. My tears approach my eye lids. Then something large jumps onto my lap, something ginger. I look at the large round face which looks back at mine, intensely that is. The large round face presses itself against me, purring loudly, and then licks my hand. I gently stroke the large ginger cat. We sit together until the compartment door opens; a tall, slim, lady approaches the cat. ‘Oh Thomas, what are you doing?’ she asks looking down at Thomas, who is busy licking his paws then cleans his ears, as if that would get them clean. The lady sweeps Thomas up, places him in his basket, fixing the broken straps with blue ribbon from her large black bag. The train stops. The porter arrives, he collects my trunk. I follow him. An elderly lady gets out of the waiting car, and opens the door for me. I hear voices behind. ‘Ah, so you are the new matron, welcome,’ the elderly lady said. I look at the wicker basket next to me; two large unblinking eyes stare back. Thomas yawns, then sticks his paw out of the wicker basket, and touches my hand. My mother’s face comes into view, I smile. ‘Miss you mother, I am not afraid anymore, it is going to be alright,’ I whisper to the wicker basket.